A number of subscription sites contain census indexes that are linked to the corresponding digital images. Be careful when using these indexes. Not all indexes include every person in the census. Some are merely head-of-household indexes. So, it’s a good idea to read the description that comes with the index to see how complete it is. Also, the same quality control may not be there for every census year, even within the same index-producing company. If you do not find your ancestor in one of these indexes, don’t automatically assume that he or she is not in the census. Also remember that many indexes were created outside the United States by people who were not native English speakers and who were under time constraints. It’s quite possible that the indexer was incorrect in indexing a particular entry — possibly the person you’re searching for. 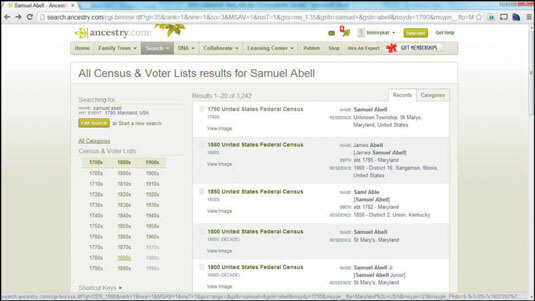 If you do a search on Ancestry.com for Samuel Abell, you see the direct link to the digitized image. In this case, Samuel Abell ranks first based on his name and his location in St. Mary’s County, Maryland. 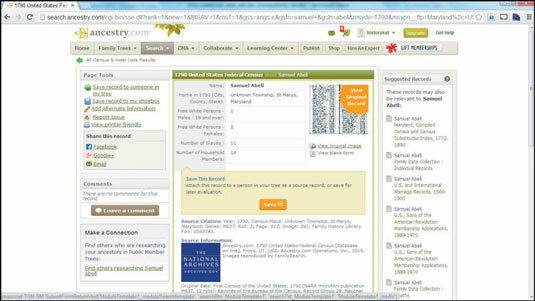 From this same search results page, you can view a textual record of the individual, as well as a link to see a digital image of the census record. In addition to presenting results based on your search criteria, this search mechanism displays other results that are similar — such as individuals with the same last name or people who have a name that sounds similar to the search criteria. If you click the 1790 United States Federal Census link, you’ll see the textual record for Samuel Abell. In the right column, you’ll see suggested records that may match Samuel Abell — making it easier to find additional records without executing multiple searches.